It is strongly recommended that you secure housing, both temporary and long term, prior to your arrival on campus. If you do not have a place to live upon your arrival in Columbus, reserve temporary housing before arriving. International students: some OSU nationality clubs (search student group directory) and the International Friendships Organization may be able to help arrange temporary housing. Rates range from $40 to over $100 per night for a single person room. If you reserve a hotel room, ask about special lower rates for new OSU students. You will be asked to show OSU letter of admission to prove OSU student status if a special rate is available. Most of these hotels are a 30-45 minute walk to the OSU campus. Free hotel van service to OSU may be available. Taxi fare to OSU from most of these hotels is approximately $15. There are two on-campus dormitory available to our graduate students, The Neil Avenue Building and South Campus Gateway. These buildings are located on South Campus (MSE is on the north side of campus) and features furnished spaces with personal kitchen facilities, and laundry facilities. Please visit the Housing website to apply or for current rental rates. 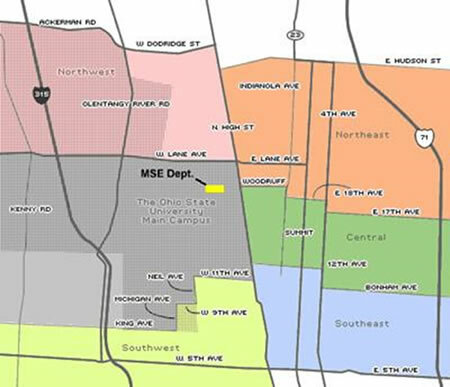 On the map of the greater campus area below are marked the locations of the MSE main campus complex, the Welding Engineering facility, and CEMAS. In general, housing to the north and west of the red line is preferred. Obviously the quality of housing and the relative safety of any given area in any city can vary, but this gives a good starting point. Located around the campus are many apartments for rent at various rates and sizes. As with any university, the quality of these accommodations can vary widely. OCSS can also connect you with other OSU students looking for roommates. 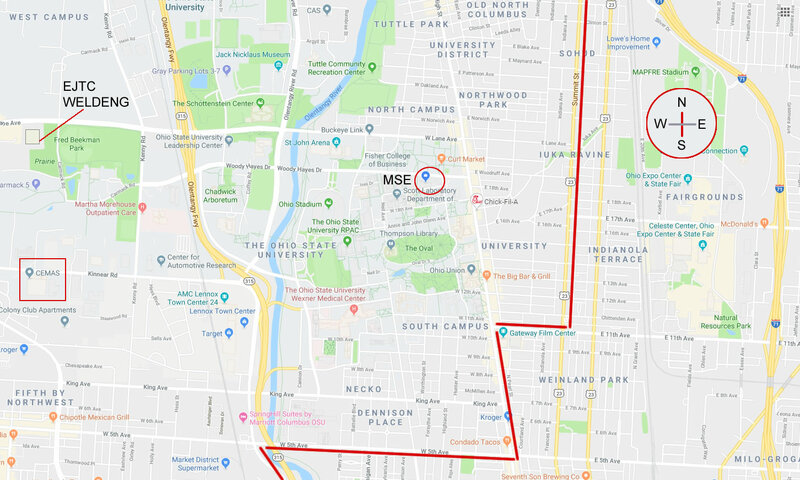 When using the Off-Campus Housing Search, select Campus = Columbus and wait for the page to refresh (you don't want to rent a room on one of OSU's other five campuses!). It is generally recommended that you look at areas north of campus or west of campus. When locating housing east of campus, you'll want to look in the area east of High St. and west of Summit Ave. and north of 11th Ave. Note: as an OSU student you have unlimited access to the COTA system when you pay your once-per-term COTA fee. Check crime statistics for a particular address or area. Preparing to Move-In includes utility phone numbers, tips, etc. (from Off-Campus Student Services). OCSS holds housing orientation sessions specifically for international students. These sessions are part of the Office of International Education's general orientation sessions. Search for Nationality Clubs Contact student nationality groups for advice on housing. Use OSU Student Organizations Directory to search for contact information for the many international student organizations at Ohio State. Below, please find just a few on-line options for housing searches. University Village Located off Olentangy River Rd just north of Ackerman near OSU campus. Offers amenities such as a private shuttle service, free tanning salon, swimming pool, fitness center, computer lab and off-street parking. Fisher Commons Located near West Campus, about 1/4 mile from the Welding Engineering program, Fisher Commons is a privately owned graduate student housing complex. This graduate community features 1 and 2 bedroom apartments designed with a spacious living area and a modern kitchen with stove, microwave, dishwasher, garbage disposal, refrigerator with ice maker, and full sized washer and dryer. Zumper.com: Find apartments for rent in real-time. A web site that is passionate about building the best way to find a home or apartment for rent. ApartmentList.com: ApartmentList delivers a comprehensive set of apartment listings in one elegant interface. By consolidating millions of properties from hundreds of well-known listing services, it uniquely delivers a universe of available apartments in one site, saving renters time and money in their search. ABODO Apartments: ABODO is an apartment search engine that utilizes the latest technologies to help make your apartment search as easy as possible. The site provides interactive Google Maps with street level images, RSS feeds, email alerts, rental data, and more. EasyRoommate.com: An on-line roommate matching service that provides housing ads for a specified city, such as Columbus and the OSU area. Move.com: Web site that permits you to search for rentals by zip code, university, or by proximity to an address (ours is 2041 College Rd., Columbus, Ohio, 43210). The Lantern OSU's student newspaper. Click on "Classifieds" for links to area apartment rentals. TheSaver.com A web site geared toward the OSU student community with a number of listings for apartments, sublets, entertainment, etc. (click on "Apartment Finder" for long term housing). NOTE: for housing near the MSE dept. select the locations "North Campus (North of Woodruff)". A secondary option would be "Central Campus (Between 12th Ave. & Woodruff)". The MSE dept. is located in the northeast quadrant of campus, on the corner of College Rd. and Woodruff Ave. (see map above). Columbus is one of the fastest growing major metropolitan areas in the country. An up-and-coming tech city, Columbus area education, research, and technology institutions are attracting the brightest minds from around the world, and the nationally acclaimed arts scene guarantees you’ll find creativity around every corner. Learn more about the city, its life, and its neighborhoods.